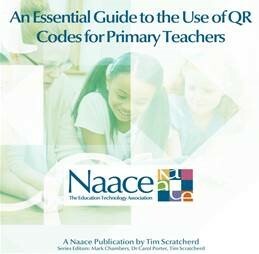 Naace believes that technology has a major role to play in raising standards in learning across the curriculum, provided teachers know how to adapt their pedagogies in order to maximise the potential gains offered by learning technologies. The eGuides help teachers to do that. The Technology Across the Curriculum eGuides – show how to use technology creatively and effectively to make significant impacts on learning and standards in other curriculum areas. The Computing eGuides – cover key aspects of the subject outside Computer Science. Technology Management & School Leadership eGuides – support school leaders in the strategic deployment of technology. The current series includes the following guides, which will become available throughout the year. Interested in sponsoring one or more of the guides? Please see more details under the “Opportunities for Sponsoring Partners” tab on the right. I picked up a QR Codes guide at Bett; it was easy to follow- we now have codes all over our displays.